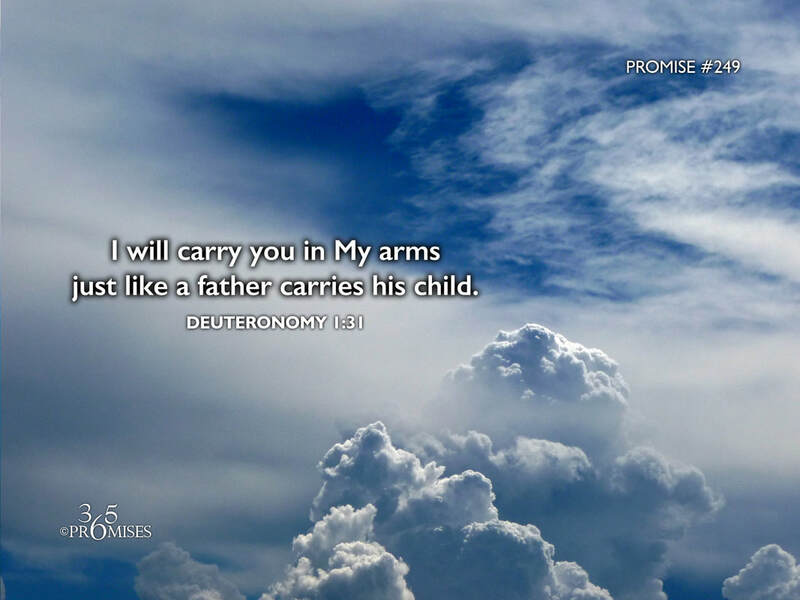 The NIV Bible says this verse this way... "There you saw how the LORD your God carried you, as a father carries his son, all the way you went until you reached this place." (NIV) This is one of those very clear pictures in the Old Testament of God's Fatherheart for the nation of Israel. I find it interesting that from God's perspective, He saw Himself as actually carrying each Israelite just like an earthly father would carry his son. I wonder what that would have looked like in the eyes of God? Would God have been cradling Israel in His big strong arms? Would He have been lifting Israel up over His head so that the nation could sit on top of His shoulders? Perhaps there would be many ways for God to carry Israel, depending on their situation. When they were grieving... When they were taking new territory... When they were afraid... God was always there to hold them and carry them through each season, whether they were even aware that He was holding them or not. The truth is that no matter how difficult life gets, it is God who is carrying us through every adversity. We might not be aware of how close He is to us, but that does not change the reality that He is holding us very close all the days of our lives. May each one of us feel the warmth of His embrace today.